If you are interested in food in general, and how it affects our society, our cultures, our habits, I would urge you to read it. It’s very interesting and not that long. My comment on it I think is actually longer, tee hee! I know that the only constant is change as the Eastern philosophies have been telling us for thousands of years but I’m not one for change for change’s sake. If you are on my blog, right now, reading this … it must mean that you have even a passing interest in good food and eating well. I want to encourage people to cook at home more, which is why I go to the trouble of taking so many photos, step by step, as I cook the dish. Home cooking should not be difficult! or take too long! Or cost an arm and a leg! Don’t let all those TV programmes and Instgram-sham hoodwink you into thinking otherwise. Presentation is of course a beautiful thing but the content of the food is always more important. End of Sermon. QUOTE: “I think that people now forget that nearly all cooking techniques we use in European countries and North America do indeed stem from France. Wealthy people and nobles from these countries did not eat the same way as their poorer fellow people and their chefs were either French or trained in French cuisine (the Russians too). In the region of Campania and the island of Sicily, which were under Spanish inspired aristocratic rule for a while, one of the kings married Marie Antoinette’s sister Caroline. This inspired a sortie of French chefs to this part of Italy, and their name was prefaced by the title “Monsieur”. The Italian pronounciation in the kitchen had a bit of trouble getting it just right and in the end it turned into “Monzù”. And the more learned Italians know of and still speak of the “Cucina dei Monzu”. Ironically, historically previous to all this, it was the Italian Caterina de Medici who brought Italian cooking skills to France. But the modern cooking techniques that are vital for good results in the kitchen were definitely developed in France. Personally, I have seen Italian cuisine morph into something that I have no trouble admitting is culinarily of a higher quality … but at the same time worries me. It’s turning into what I call French-style cuisine using Italian ingredients – could be dangerous in the long run because the whole point of traditional Italian cuisine is that it be simple, easy to prepare on the whole, and with few ingredients – which is why it has been handed down from generation to generation no problem. Now that the standards in terms of ‘technique’ keep rising, with restaurants presenting food more and more in what I call the instagram-obsessive-compulsive-disorder way, and TV food programmes aiding and abetting the trend, it may be that people in Italy will cook less, meaning find cooking more time consuming. And this might well lead to less home cooking, sigh. One of the saddest thing I notice in Italian restaurants now is the demise of the vegetable side plate, the “contorno”, which had to be ordered separately, giving the customer the choice of what he or she preferred. The vegetables are now increasingly presented on the same plate as the main course, the way I’ve always seen it done in the UK and in North America. The word for jazzing up a traditional dish in Italian is “rivisitato”, translated literally this means “revisited”, meaning ‘updated’. The reason for ‘updating’ many traditional Italian dishes is that they relied on a heavier fat content, I presume, or overcooked the ingredients – so the idea of improving on the original is not a bad thing per se. It’s all the other frills that bother me, the lengthier gilding-the-lily procedures and the disappearance of an actual name for the dish. Nowadays, the dish has to be described, listing all the ingredients. Who the hell is going to remember it ten months from now, let along ten years from now? 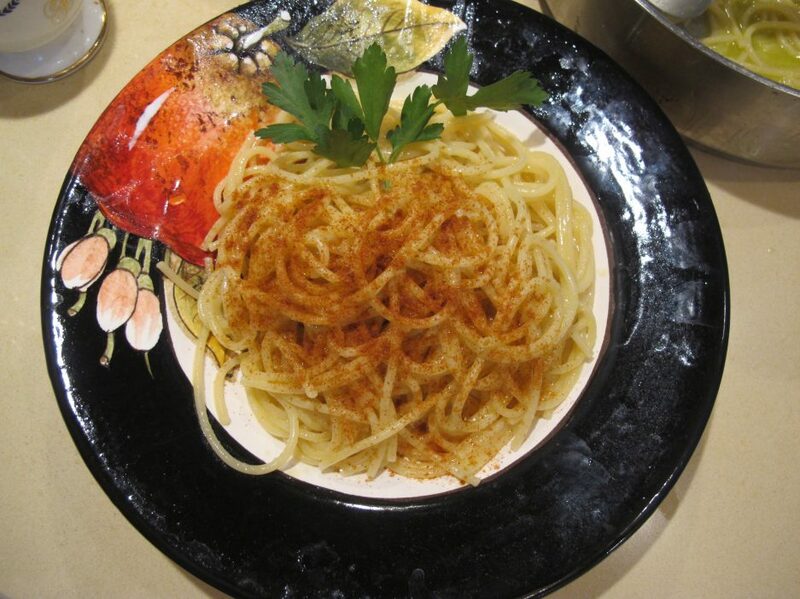 “Rivisitato” is the Italian answer to yesteryear’s Nouvelle Cuisine. We all know of the dangers of fast food … we should now start awakening our senses to the danger of haute cuisine techniques muscling its way into the kitchens in our homes. My mother in law Maria hails from a small hilltop town in the Marche called Monterubbiano. When my father in law retired, he bought a house there which became the Summer Holiday go-to venue for me and my husband and our kids for several years in succession. There comes a point in children’s lives when they feel it’s no longer ‘cool’ to spend holidays with their parents and sure enough, that happened with us too. Even so, Monterubbiano maintains an iconic status in the vault of family memories, and always will do. So many outdoor dinners, friends and family gatherings, laughter and silliness and looking forward to future frolicking. My in-laws leave Rome some time in May and stay in Monterubbiano until early September, sometimes very late August when the weather there can change sooner than it does in sunny Rome. Monterubbiano can get very ‘foggy’ in no time at all, even during the Summer, not to mention unseasonably chilly. It is close to a mountain range, after all. The view from our bedroom early one September morning … foggy. When our daughter was little she used to call it “il fumo della pioggia”, the smoke of the rain. Monterubbiano’s signature food dish is the “tagliatelle fritte”. These are fettuccine cooked and seasoned with a bechamel and cheese sauce, then shaped into a ball, breaded and fried. They are served with a tomato sauce. One ball per person is enough, let me tell you, they are indeed very ‘rich’ ! My husband and I adore the sea and there was no way we would have spent so many weeks in Monterubbiano, Summer after Summer, if it wasn’t within easy access to the sea. It is a twenty minute drive away from the town of Porto San Giorgio. An Italian singer called Piero Focaccia came out with a song in 1963 that says, “For this year, don’t change, stick to the same beach, to the same sea, and come back to me” (https://www.youtube.com/watch?v=qvaCyff7Jn4). This attachment to “sameness” is a concept that non-Italians will perhaps find difficult to appreciate but is a way of life that is deeply imbedded in the culture (or was rather, things change, even in Italy.) When my daugher was just one year old, we sought a beach that was relatively “quiet” and off the beaten track, not too crowded etc. When I say beach, I mean a beach with with the usual frills and accommodation that are a staple in Italy: sun beds, sun umbrella, drinks and a loo/rest room (facilities that make life very civilised to my mind). They call them “chalets” there, just as one has chalets up in the mountains. Anyway, to cut a long story short, we espied one of these chalets just opposite a convent and that did it for us. Some of these chalets can be very ‘cool’ places for young people to throng about, as they strut their stuff and put music on and generally do what young people enjoying life do: make a lot of noise, laughing and joking, smoking and canoodling. We presumed that no young person worth his or her salt would be seen dead within walking distance of a convent and we were right. This was a family place, with not just parents but grandparents too. The gamut of generations ran from nappies to bikinis to sun-dresses and included a forgiving attitude towards bulge, fleshy flab, deeply lined facial expressions, paunches, stretch marks, and many a leg heavily laden with varicose veins. Perfect. It is still called “Bagni Giuliana”. The owners, husband Cavicchi and wife Giuliana, were so accommodating and pleasant and kind that we returned to them the following year. And the one after that. And then the one after that one too. In other words, we never changed our chalet and the writer of that song would be proud of us. We are welcomed like family when we return, they have literally seen our children (and their friends when they came with us) grow up. And we, unfortunately, have seen Mum and Dad die, although we are pleased that their two daughters continue to run the place (which was thoroughly modernised about 20 years ago). The pull of the familiar can never be underestimated. Anyway, as life cracks on for my mother in law, her body has begun to show cracks of its own. Two knee replacement operations make it hard for her to walk properly now but the real reason for this unsteadiness is that Alzheimer’s started its unwelcome inroads on her health. She is ever more forgetful now, and often gets confused, or tells a story over and over again. Fortunately, she continues to be a good story teller, and her innate kindness, sense of wonderment and impish naughtiness (her motto? “God save us from the virtuous” – Dio ci salvi dai virtuosi … ) continue to attract young people to her. She may not have been the best home cook in the world but she certainly was a jolly good one and that’s where the sadness sets in. Basically, she cooks no more, and I know that my father in law suffers for this. Not that he would ever complain, he is too proud. That generation never would – their complaints are lodged in other fields of human interaction. He makes do, buying nice cheeses and cold cuts, and making a basic pasta for himself. Or buying ready-cooked veggies and rotisserie chicken. He won’t die of hunger, oh no. But he, like me!, lives for his food, for a decent meal and it must hurt so much not to be able to enjoy a ‘decent’ home cooked meal on a daily basis. Especially since he spent all his life with his wife making him one. Dear Reader, I can’t tell you what pleasure it was for me to cook a decent meal for him when we went to visit them last Summer in Monterubbiano. It gives me so much satisfaction, the kind that only another home cook will understand. It’s all about making people happy, even if a grunt is all you’ll get out of them on occasion. It’s about the joy of seeing someone reach out for another helping, just a small one, and then another, again – just a small one. Of seeing them studiously mop up the sauce on their plates with a bit of bread. Oh hearing them sigh and exclaim that they couldn’t possibly eat another thing, they’ve eaten so much already (true, very true). And then seeing them fall asleep, head nodding, on the sofa as they pretend to watch a bit of telly afterwards. Of their face when you ‘force’ leftovers on them to take home in batches of plastic containers that you’ll never see again (who cares!). Eating is all about evanescence. A lot of work and trouble growing/making food and then pouff! it’s gone in a few moments in the eating. The pleasure principle of it all. A huge big fat Zen lesson there, surely? Anyway, last Summer we visited Maria and Giose on a number of occasions, all of them poignant for the above and other reasons. One of Maria’s best friends there, Liliana, is a brilliant cook and organises mega dinners for the town al fresco. All the proceeds go towards the upkeep of the local football team. If you have the time, I’d like for you to watch a wee video I took of a dinner she organised. Plastic plates and plonk for wine, but really good food I tell you! All for the magic price of Eu 10 per person. With a local live band. The guy playing the trumpet? Enzo. Always cracking jokes. He is the retired owner of the town’s only grocery shop and played a surprise Serenade for me and my husband the year we got married with a bunch of other musicians at around 2 a.m. The much appreciated serenading was followed up by sandwiches and jugs of wine and hearty snacks all organized by my in laws. The lady with the walking stick is my mother in law, Maria, being escorted by my husband, her son, Pino. We returned one last time early in September, in time to celebrate my father in law’s birthday. My birthday present to him? Lots and lots of sauce for making pasta. And the sauce in question was made from the Coda alla Vaccinara recipe. I’ll write about it in the very next blog. Question: how many people still ‘do’ Sunday lunch these days? Meaning, as the high point of the gastronomic week, as the family get-together nexus, as the excuse to invite good friends for a slow-paced convivial experience? Culturally speaking, I associate this ‘special’ Sunday meal with the rightly famous British Sunday Roast and with the Italian “Pranzo della Domenica”. Meaning, question again, was the Sunday lunch a big deal in other countries too? I’ve not heard of it being celebrated in North America, or France or Spain or the Netherlands, Scandinavia or Germany/Austria/Switzerland or Eastern Europe – but of course that’s not to mean that it does not exist in these geographical parts, simply that I’ve not heard about it. So far as my family is concerned, this was never a tradition chez nous. I’m of maverick stock. So no one would say that I am an ardent proponent of the Sunday luncheon. That said, it’s primarily because it means having to prepare much of the meal the day before, and wake up at the crack of dawn on the day to get everything done spit-spot. It’s the timing that’s tiring for me. Drinking wine is most definitely part and parcel of the pranzo della domenica and then what happens, eh?, I ask you? One gets sleepy and yearns to catch forty winks – what better way to book-end the experience than a Sunday nap? But if one is with friends, or not in one’s own home, this is not an option and it becomes hard work staving off the droopy eyelids despite the copious cups of post prandial coffee. Sigh. I get woozy after a boozy dinner too but going to bed is the natural next step and falling asleep is simply bliss. So, yes, these are just some of the reasons why I prefer a dinner on the whole. They say that the mundane is to be cherished. True. How much more, then, should a ‘special’ occasion be appreciated ! It stands to reason. Which is why I heartily accepted an invitation to Stefania Barzini’s for Sunday lunch the other day. This was not the first time I had enjoyed a Sicilian menu cooked by her and her friend Paolo Colombo (if you have not heard about Stefania, you can read all about her in this piece I wrote: https://frascaticookingthatsamore.wordpress.com/2016/11/23/kale-crostini-by-stefania-barzini/). Another attraction (well, for me at least) is that because the invitation is open to people who are interested in a top-notch home-cooked meal presented in the chef’s own home, you never know who you are going to meet. Some are friends of Stefania’s, some are acquaintances, and others are complete newcomers. The atmosphere is one of a hail-fellow-well-met welcome, sit yourself down, and eat and drink. Very little fuss, people are supposed to cooperate. They are expected to mix and mingle as Stefania and Paola see to the finishing touches and bring in the food, course upon course. Since, on the whole, it is mostly I who do the cooking for dinner parties, on top of the mundande-to-be-cherished daily meals, I confess that not having to lift a finger (other than to eat) for a change is a feeling I embraced to the hilt. I felt so spoilt. My delightful daughter who loves Sunday lunches (as well as all things Sicilian) decided to join me and that was an added and unexpected bonus. I love Stefania and her husband’s home, not to mention the kitchen!, it seems made for this kind of entertaining. Stefani’as kitchen before the onslaught of the guests. I served some fantastic just-fried saffron-steeped rice balls as an ice-breaker to a group of people sitting on the sofas around the large coffee table. “Since you are all too shy to be the first to grab one, I shall pass the plate around,” I said encouragingly. No further chivvying was required after that – we all partook with a vengeance of whatever was put before us as nibbles before sitting at the tables for the main courses. Oh this citrus-buttressed chicken liver paté … I couldn’t get enough of it. There was also a large platter of cured meats from Sicily (silly me, didn’t take any photos) as well as home-cured olives and pepper flecked cheese from the Nebrodi region of Sicily. Nibbles galore. And then, once seated at the table(s), we were served our pasta course. Ravioli stuffed with fresh ricotta and dressed with a mint and sage sauce. A sprinkling of pecorino cheese. And were they good? Is the pope catholic ….? No, seriously. They were excellent. The texture of the home-made pasta was incredble, it was as silky as the ricotta stuffing. The flavour was of course a savoury one but there was just a hint of sweetness that the mint and sage offset beautifully. Very more-ish indeed. The pièce de résistance … the brioche salata, or “brioscia”. A pie named after the French brioche, I presume. This, as well as the other recipes, were all from Fabrizia Tasca Lanza’s repertoire, for which Stefania was most grateful, as were we. By the time the ‘brioscia’ arrived on our table, I was feeling pretty much full. It is a very rich dish, sumptuous. It was served with an intriguing lentil dish. It may not look like much but these lentils were super. They were cooked with an orange and a lemon, and dressed with olive oil, lemon juice, a little bit of chilli and fresh mint. It’s definitely a recipe I want to incorporate in my repertoire. The bottom of the brioscia was slightly burned but no matter. And then came the dessert. Two desserts. This was my helping, I simply couldn’t eat any more but I can tell you – it was really delicious. And I’m not usually a great pudding eater. And here is the tangerine ‘gelo’ – il gelo di mandarino. A gelo is a bit like a jelly in consistency. The tangerine flavour coupled with the pistachio (and don’t the colours pair well too!) was intensely satisfying. And it ‘cleaned’ the palate, so to speak. It was definitely time for coffee. What a meal! Here is a lovely photo of Paola, Stefania’s friend and co-host. And no, I didn’t take any photos of Stefania. Normally I’m the one taking photos of everything and everyone but today I was just relaxing and involved in the various conversations. What’s a Sunday lunch about after all! The photo of Stefania below, and a few of the above, were taken by Stefania’s friend Donatella Monachesi. Stefania looking after her guests. And this one is of Donatella holding forth and intriguing us all with her witty conversation. The lunch was followed by a viewing of a documentary all about Sicilian food traditions. I had to miss this opportunity because it was time to go home for me.